The second-last day of expiry of the current derivative series saw the Markets oscillating in a 80-point range. The Markets saw a modestly negative opening and got weaker in the early trade. However, a sharp recovery followed and after a ranged oscillation, the NIFTY ended the day posting nominal loss of 18.95 points or 0.18%. As we approach the expiry day on Thursday, we expect the Markets to maintain a similar range. 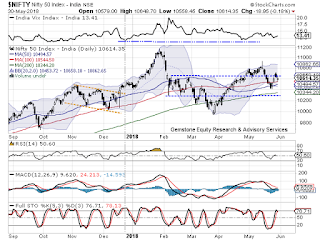 The support was seen coming in near 100-DMA which stand at 10544 while it will face resistance in the 10650-10680 zones. The amount of shorts that still exists in the system are likely to coming into play as the session is expected to remain dominated with rollover centric activities. Thursday will see the levels of 10650 and 10680 playing out as immediate resistance area for the Markets. Support is expected to come in at 10540, near its 100-DMA and after that near 10500 level. 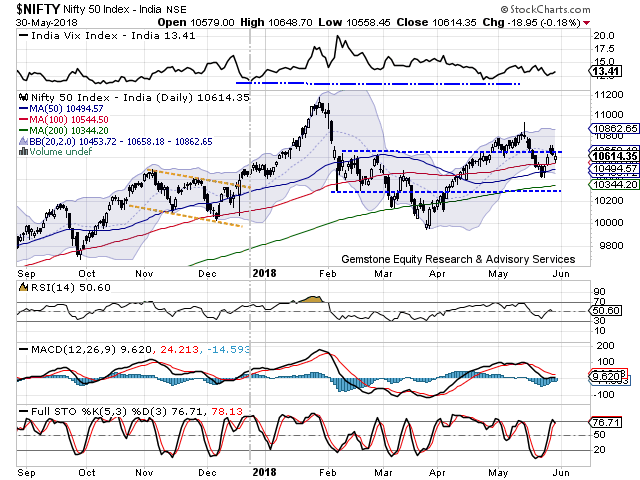 The Relative Strength Index – RSI on the Daily Chart is 50.6014. RSI continues to stay neutral showing no divergence against the price. Daily MACD stays bearish while trading below its signal line. No significant formations were seen on Candles. Pattern analysis shows two important levels coming into picture. First is the 100-DMA level which is seen coming into picture as NIFTY took support at this level in the previous session. Secondly, on the upper side, the level of 10650 which happens to be the multiple pattern resistance is likely to pose resistance in event of resumption of the pullback. Overall, there is significant number of shorts that were seen being added and they still continue to exist. We expect a quiet opening to the trade and a range bound movement in the early part of the session. However, there are chances that the Markets see sharp moves as some short covering might happen. The primary reason for this likelihood is the though the month of May continued to see addition of shorts, the month of June have been witnessing long rollovers. We recommend a cautious but positive view on the Markets for the day. Favorable technical setup is observed in stocks like IDBI BANK, INDOSOLAR, LT FOODS, COAL INDIA, BLISS GVK PHARMA, CUMMINS INDIA, KITEX and ASTRA ZENECA PHARMA.